Thank you for the Hurdy Gurdy plans and parts I recently purchased. They arrived safely and promptly. Needless to say I'm busy on the project at the moment. May I take this opportunity to thank Musicmakers for their quality of service and assistance with my instrument-making endeavours over the past couple of years. Without exception I have found the project plans and instructions precise and easy to follow, making the projects interesting and enjoyable to construct. They have provided a great sense of satisfaction on their completion and many hours of enjoyment as family members learn to play the instruments. Thanks again to you and the Team for your friendly and helpful service and support. I purchased your digital download of 50 assorted harp plans a few weeks ago and I have loved reading the articles and accompanying blueprints. �Not only am I happy with such an affordable price for so many plans, but I was also pleasantly surprised to receive your summer 2013 catalogue! � I have been scouring the internet looking for the best prices on hardware parts and I found them right in the back of your magazine. �I will most certainly be ordering from �you in the future. My Hurdy Gurdy - made from your excellent plans. The harp I made from your plans came together without any problems. The drawings were excellent. I cut out the plans and traced them on to the wood. They fit together perfectly. I am donating the finished harp to a church that is building a model of the desert tabernacle of moses.....I think I will try and build the hurdy gurdy next. I have just completed one of two Regency harps I am building from scratch for my wife and wanted you to know that the sound is awesome!!! 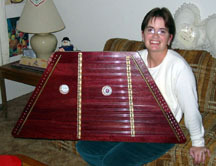 My wife began taking harp lessons in January using a rented harp from another well-known maker. There is no comparison between the Regency and the other harp - the Regency sound quality is much better and louder. My wife's harp teacher commented that she had seen many Regency harps but that ours was the best in terms of beauty and sound. We couldn't be happier with how this project turned out. What a rewarding experience this project was for me (and my wife). When my wife sat down to play the Regency for the first time it nearly brought me to tears. I have not yet added the Universal sharping levers I recently purchased but have viewed Jerry's YouTube video and feel confident this effort will go well after we arrive in NJ. I just finished building a 17/16 hammered dulcimer from your plans and hardware. It turned out beautiful and sounds great. I used birds eye maple for the top and bottom rail and mahogany for the sound board and bridges. The mahogany and hard maple came from where I work(they have a pattern shop) and the birds eye maple was given to me also.I attached some pictures. Thanks again for your quality products and service. I don't do Facebook, but I thought you'd like to see the Studio Harp I just finished. I still have to make longer legs for it and it will take some time I am sure for the tuning to stabilize, but it is mostly done. The plans worked well. I picked up a couple of tips should I build another Studio Harp. And it only took a couple of weeks in the evenings and weekends to build it. I will have a hard time waiting until Christmas to give this to my daughter. The next harp I build will be a Shepherd Harp. I am glad I chose Musicmakers instead of any of the other harp kit alternatives out there. I wanted to send some pictures of dulcimers that i builded from your plans that i bought from you sometime ago. One for myself and one for my friend. Now they are both ready. These are made of sitka spruce top, finnish birch back and sides and indian rosewood fretboard. Never seen these kind of instruments before or played one but these sounds really good and are pleasure to play. I have bought several items from you over the past couple of years, from blueprints to parts to Jerry's harp making journal, and have been very pleased with the service and friendliness of you all, plus the quality of the products. I have attached some pictures of a couple of these that I have made for you to look at. The designs are modified somewhat to my taste, but still basically the Shepherd model. Since you've spent a considerable amount of time answering my questions (some smart and some not so much), and therefore to a certain extent are responsible for the the creation of my 31-string Gothic harp, I thought you might at least like to see what you've done. Whether you consider this something you can be proud of or something you can be blamed for is for you to decide. I have a reasonable amount of woodworking experience, though little of the finish variety--mostly things like decks, garden sheds and other hack-and-attach projects. I've never made a musical instrument before, so I thought I'd get my feet wet with something simple. So I built your Lil' Lyre kit. As this turned out reasonably successful (it has ten strings and makes sounds, which I assume is a good thing), I wanted to try something that was a little more challenging. What did I choose for my next project? Something that indeed is a little more challenging than the Lil' Lyre--the 31-string Gothic harp. Not the kit, mind you, but from scratch. Yeah, I know--your web site says "Our Gothic harps are our most challenging harps to build." But hey, the Lil' Lyre has ten strings and makes sounds, so I figured that the Gothic harp has 31 strings and makes sounds. How hard can it be? Yeah, right. A few months (and many mistakes, discarded and remade parts, and a lot of fun) later, I finally strung my completed harp. I've attached a photo for your amusement. It's made of African padauk and finished with only clear urethane topcoat to preserve the lovely orange, nicely-grained character of natural padauk. While padauk is a hard and heavy wood, I wasn't sure about how it would stand up to the rigors of being a harp. I found only one reference online to a harp that was made of padauk, but it had nothing to say about about sturdiness or what was done to enable it to survive the tensions of a fully-strung harp. So, in an attempt to ensure adequate strength, I constructed the neck and pillar in a slightly different sort of way. In addition to being strong, I wanted the neck (and pillar) to at least appear to be a single piece of wood, with no laminations or reinforcements showing. So I started with a 2" thick board, sawed it down the middle, and hollowed out both pieces so that the hardwood was only about 1/4" thick. Then I filled the hollows with eight layers of snugly-fitted 3 mm GL-II aircraft birch plywood (think of it as a plywood inlay), and glued the two halves back together. The result looks from all angles like a single piece of wood, but is actually a 42-ply laminate. Whether this was a good idea or not remains to be seen. Will it crack? Will the pins hold? Will it explode in a shower of birch and padauk splinters and twanging strings? Time will tell. At least I was able to completely string it without a hint of problems. All that's left, then, is installing the sharping levers. After I mortgage my house, I'll be ordering these which, coincidentally, cost almost exactly what I have invested in the rest of the harp. Feeding a habit is expensive. So, thanks to all the kind folks at Musicmaker's, I have an actual harp. And after about another month of tuning, tuning, tuning, I'll be able to sit down and, well, look at it. Maybe I should consider learning how to play it. But where would I find the time? There are Limerick and Regency harps sitting in my shop, just waiting to be coaxed out of a stack of lumber. I will start out by telling you that this is not the first hammered dulcer that I have built.That said, I would reccomend your blue prints over any others that I have tested. Anyone with a little patience and woodworking ability can build a quality instruement that sounds great and looks great. Your lay out is precise,instructions are easy to follow. I did make some changes that made stringing the instruement a little easier.I cut the delrhin into 1/2 inch peices and super glued them to the bridges.This way you don't have to go under anything and it's much easier.I plan to build at least 5 more using your plans and I will not be ashamed of pricng them at 1k each.When I have time I want to try one of the mandolin plans and I'm sure I will be just as pleased. Your plans make it possible for anyone to build and own a quality dulcimer. God Bless those that help others. Attached are photos of a Regency based harp that I scratch built from your excellent plans and blueprints.� Aside from some cosmetic changes, adaptations�and trim the harp is "regency".� I used Bubinga for the neck and pillar and base, African Mahogany for the body sides and Paduuk for the trim.� The soundborad is 5 ply Finnish aircraft birtch ply and the back is 5mm Oak plywood. The lower side decorations are your Celtic Knots. I have been tuning it only for a few day and the tone, timber, volume are excellent!� Thank you for the superb plans and blueprints.� My wife plays and is very happy with this instrument. �I will be getting levers from you shortly and installing when the pitch settles. Notes on the photos: The detail of the 'key' at the pillar to neck joint - I used a piece of ebony left from a guitar fretboard.� 3/8 thick, installed 1/4 inch into the Bubinga.� Unfortunately my router slipped on the very last cut and made small divet on one end of the broach... Not enough leeway with the already cut Key so I had to apply some trim.� Also, besides glue and dowelling, I used quite decorative brass funiture bolts as well (think the joint is secure! ).